San Antonio is a fun town. Go visit. Jim “The Travel Organizer,” who last wrote about Valley of Moon, California, Dubrovnik, Croatia, Split, Croatia, Krk, Croatia, Koper, Slovenia, Mendocino County, California, Auckland, Oslo, the small German town of Speyer and Deidesheim, Oahu, Napa Valley, Venice, Singapore, Bangkok, Sonoma County and Myrtle Beach, and here are his tips should you visit. Over half of global travelers (53%) report that they plan to take more weekend trips in 2019. Forbes calls this trend “bite-sized travel”; others use terms like “micro adventures,” “micro-travel” or “micro-holidays.” These “micro trips…are well planned and even better executed short trips which maximize destination time, minimize wasted time and cut down on expenses with clever flight times and usage of optimal time zones” (God Save the Points, “Micro Trips: The Buzzing Travel Trend of 2019, January 26, 2019). Little did I know my travel plans would be “trending” (believe me, no one who knows me would ever accuse me of being a trendsetter! ); it just so happens I have 4 such micro-trips planned for 2019 which I plan to write up for The Flight Deal: San Antonio and Austin (Texas), Portland (Oregon) and even Hong Kong! So, let’s start with San Antonio…. Some of the best flight deals around – when you can make them work for you – are American Airlines’ “reduced mileage awards.” If you hold any of 14 (!) American Airlines-branded credit cards and have even a modest stash of redeemable miles in your AAdvantage account, these offer significant savings. It just so happened that American Airlines put one of my home airports and San Antonio (SAT) on sale in January and since I hold the Aviator Silver card, I could book a direct flight for just 8,750 miles (a savings of 30%!). Then, using 30,000 Wyndham points, I booked 2 nights at the well-reviewed La Quinta Inn & Suites, San Antonio Airport location since our flight would be getting in after 9pm. The La Quinta’s full, hot breakfast saved us money on meal costs. I also saved a day’s car rental by using the free shuttle to the hotel upon arrival and back to the airport the next morning to pick up our rental car. 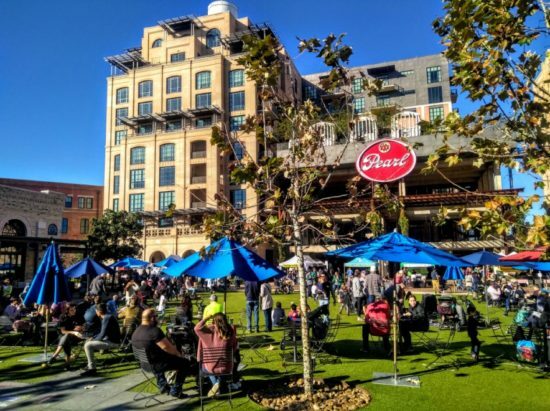 Called “the hottest neighborhood in San Antonio” by National Geographic, The Pearl is an urban revitalization district named for the historic Pearl Brewery building that anchors an eclectic assortment of shops, restaurants, condominiums and green space. Just 9 minutes from our hotel, we timed our visit to coincide with the Pearl’s weekend farmers’ market which features local vendors, cooking demonstrations and live entertainment (pictured here). There are all sorts of quirky, fun things to do here. For example, if you’re lucky, you can score seats inside cast iron tanks once used to ferment beer at hip Hotel Emma’s bar. Tip: Parking (more on this topic below) is easy and free here. Arriving early, we found space in the surface lot on Karnes Street between East Grayson and Emma Koehler Streets. The multilevel parking garage at Isleta and Emma Koehler Streets usually has space and is always free as is the River West parking lot on East Elmira Street between East Miller and Schiller Streets (walk across the covered pedestrian bridge to the Pearl). Ranked in the top 1% of restaurants in San Antonio by TripAdvisor, Pete’s Tako House is something of an institution. Some locals contend that Pete’s enduring (it opened in 1978!) success is due to having been blessed when Pope John Paul’s motorcade passed by in 1987. Portions are large so be careful not to over-order; filling on the tacos are an inch thick. Tip: First-timers should consider ordering Poco de Todo (“a little bit of everything”) an overflowing plate of flautas, quesadillas, chalupas, nachos and beef empanadas that costs just $11.99. You can’t go to San Antonio and not spend some time strolling along “the largest urban ecosystem in the nation” — the River Walk. The River Walk is a network of paved walkways stretching 15 miles along the San Antonio River one story below street level. The Pearl and the San Antonio Museum of Art are both on the “Museum Reach” (northernmost section) of the River Walk; the most commonly photographed and most heavily traveled section is the “River Bend” section. Tip: If you are driving, parking downtown can be challenging. Many ground lots advertise $5 parking – but be very careful! That $5 is only for the first 2 hours and we found many of the unattended machines where you pay (in advance) weren’t working properly. We went on a Saturday afternoon and parked for more than 3 hours in an attended, safe and covered garage at St. Mary’s Garage (entrance on East Travis Street between North St. Mary’s and Navarro Streets) for just $5. 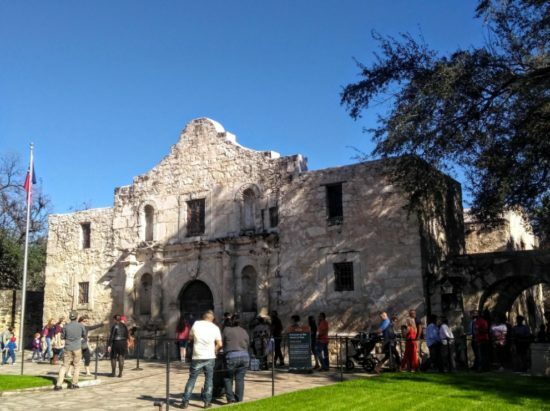 If asked to name the building pictured here, most would say “The Alamo.” Actually, while certainly the most recognizable building, this is only the chapel that was part of a much larger mission and fortress compound, the original name of which was Mission San Antonio de Valero. The vast majority of the original structure was torn down long ago but thanks to technology it is possible to visualize exactly what the battlefield looked like in 1836 (just click on the word “visualize”). Tips: Although entrance to the grounds, including the chapel, is always free this is one of those instances where paying for a guided tour is almost a necessity for non-Texans since most of what we know about what happened here we learned from Hollywood. Using the discount code “CONVENTION” will reduce the price of your guided tour by $3. If you decide to forego the tour, be sure to view the films which run continuously in the arbor building behind the chapel to better appreciate the actual personalities, events and importance of Texas’ most visited landmark. Our meal here easily ranked in the top 10 of all our travels – and that’s saying something! My wife ordered the pan seared sea scallops ($36) and was thrilled with her choice. Her plate consisted of 4 ginormous scallops atop a cauliflower puree with sugar snap peas on the side. I chose the grilled beef tenderloin over a bed of buttermilk-chive mashed potatoes and jumbo asparagus with a cognac mushroom cream sauce ($39). The filet was perfectly prepared and complemented beautifully by the sides. The restaurant also has an extensive wine list and offers a prix fixe menu until 6:30pm with 5 entrée options and choice of 3 salads or dessert (add just $3 and get both choice of salad and dessert to complement your entrée selection). Tips: There are multiple dining options at this address; Nosh (more casual dining) fronts Austin Highway while the parking and entrance for Silo is around back. Silo is on the OpenTable system for reservations and if you can score a Groupon, the savings can be significant. What is it with repurposed breweries in San Antonio? The former Lone Star Brewery complex is home to the San Antonio Museum of Art. Most genres are represented here. The American gallery features Bierstadt’s “Passing Storm over the Sierra Nevadas” while the Latin American gallery includes some fine examples of Diego Rivera’s work. Parking in a surface lot directly opposite the museum entrance is free. Tips: Admission (normally $20/adult, $17/senior, $12/student and free for children 12 and under) is free for all on Sundays from 10am-Noon and on Tuesdays from 4-9pm. There is also a free hour-long, docent-led tour of SAMA’s highlights on Sundays at 11am. 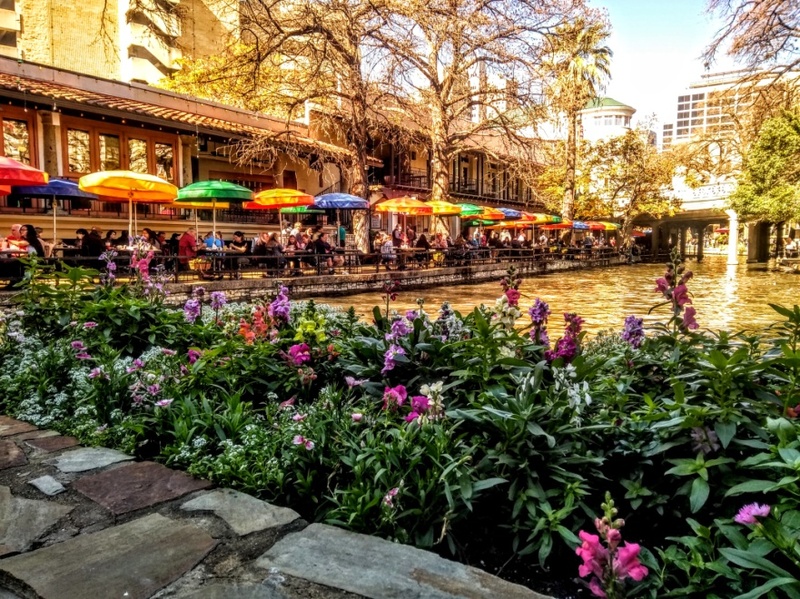 Overlooking the San Antonio River on the Museum Branch of the Riverwalk just behind SAMA is Tre Trattoria which features classic Italian cuisine. Just across from the Alamo is San Antonio’s franchise of this New Orleans institution famous for dueling pianos and creation of the hurricane cocktail (served in a souvenir glass) in the 1940s. The menu, as you might expect, focuses on Cajun, Creole and N’awlins specialties (think muffaletta and Po’Boy sandwiches, jambalaya, crawfish etouffe, shrimp and grits and beignets). Tip: You can purchase a coupon good for up to $20 worth of food for $10 through the Dining Advantage program. 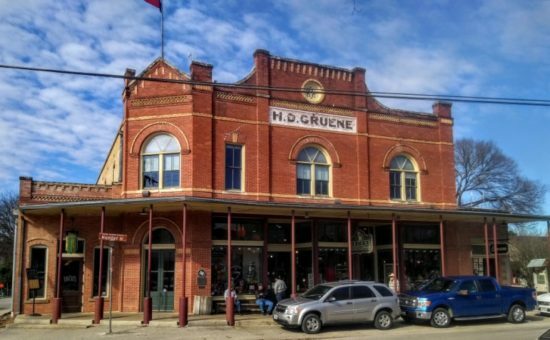 About halfway between San Antonio and Austin (Exit 191 northbound on I-35) is the Gruene Historic District, home to Texas’ oldest dance hall featuring live music every day. Most daytime shows (usually 4-hour sets) are free; admission is charged for weekend evening shows. Headliners over the next few months include Lee Ann Rimes and Boz Scaggs! Between sets at Gruene Hall, you can wander over to The Grapevine which offers free wine tasting. You can also watch a potter at work at The Barn Pottery, a gallery filled with functional and decorative pieces created by a number of central Texas artists. Some will describe Gruene as “inauthentic” or even a “tourist trap;” we spent a very enjoyable few hours here listening to good music without even a cover charge and wandering through the eclectic assortment of shops and galleries. Tip: We found parking on the left-hand side of Gruene Road just past Gruene Hall as you enter town.